You are at:Home»Herbs»Pastinaca sativa Linn. Latin name : Pastinaca sativa Linn. Description : The rhizome is useful in erectile dysfunction, spermatorrhoea, nocturnal emission, general, sexual and seminal debility. Given to nursing mothers, it increases breast-milk production. The root contains xanthotoxin, which is used in the treatment of psoriasis and vitiligo. Xanthotoxin is the substance that causes photosensitivity. Recommended Dosage : 3 to 5 g powder of rhizome. 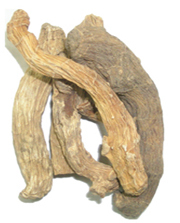 Contraindication : Persons with weak kidneys should avoid this herb. Parsnip contains polyacetylenes, which have shown cytotoxic activity. Caution is advised in patients taking anticancer agents, as the combination may have additive effects. Parsnip may cause photosensitivity. Caution is advised in patients taking other agents that cause light sensitivity, as the combination may increase this side effect. Individuals allergic to birch pollen may have cross-sensitivity to parsnip.